Terry James has cut new pathways through the troubling UFO mysteries with his novel, “The Rapture Dialogues”. 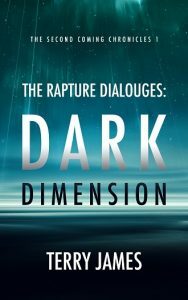 “The Rapture Dialogues” is a story that explodes the mythology wrapped up in UFO/sightings phenomena, with a unique view toward supernatural beings interjecting themselves into today’s world. The novel’s depiction from the discovery of the Dead Sea Scrolls, and the 1947 Roswell incident, to the 1967 “Six Day War,” propels the reader swiftly forward to the present day, and prepares the stage for biblically prophesied events. The novel’s subtitle, “Dark Dimension,” encapsulates the ominous supernatural portent that insinuates itself into the lives of the characters who dynamically traverse the story’s 384 pages. The Rapture Dialogues rages frighteningly toward what prophets present as an electrifying future for Planet Earth.